Tim Hyatt, Jalel Aossey and Yasser Khater. Islamic Services of America (ISA) based in Cedar Rapids, Iowa, USA attended all the JAKIM Malaysia event offerings during the 9th Halal Certification Bodies Convention at the Le Meridien Putrajaya Hotel in Putrajaya, Malaysia. The convention itself was held on April 1 and 2 with representation by 69 Halal certification bodies from 42 countries. This was followed by the IHAB (International Halal Accreditation Body) General Assembly on April 3. These two events were preceded by the first HPB (Halal Professional Board training courses for executives and auditors which were conducted March 26 through March 30 and the concurrent IHTCDP (International Halal Technical Capacity Development Programme) on April 1 and 2. The week long day and night HPB training courses were attended by over 120 participants split between Halal QA technical auditors and Halal certification body executive management. The executive course elements were heavily focused on Halal Assurance System Management criteria which are owned by HCBs and manufacturers at all levels of their organizations to ensure Halal training, monitoring and implementation processes are in place, audited, confirmed and then remedied as needed at every stage of their operations. The two day HCB convention featured a number of speakers and topics including technical overviews of gelatin, the pharmaceutical and emerging medical device industries, Muslim friendly tourism and Islamic finance among others. The IHAB closed door session was for JAKIM listed global Halal certifiers only. 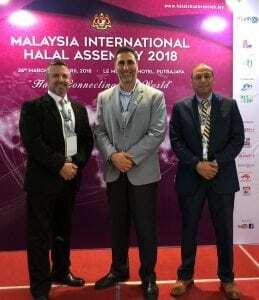 This was the first of more meetings to come on the global standardization and mutual recognition of leaders in the Halal industry. More importantly, it further established Malaysia as an early and ongoing leader of Halal initiatives which garnered strong support from the attendees. ISA is proud and pleased to be a regular attendee at JAKIM sponsored events and we always enjoy the personal camaraderie and professional cooperation shared by fellow Halal certifiers from all over the world.